For this 3-week animation project (30 seconds animation) we were tasked to animate according to a brief we’ve chosen and keep focus on performance. It is required for us as students to make a timetable and do good research and planning before we start animating. We also had to choose a rig ealry on, the rig should have a face that later on should be animated accordingly. The lenght of the animation should be 25-35 seconds excluding intro and outro, we were not allowed to have dialouges or sound effects but we could use music. The framerate of our animation should be 24 fps. The camera should stay still without cuts or movement (like a theatre stage), composition is important here. 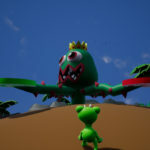 Another requirement is that we were only allowed to use one character and we could also use assets created by someone else as long as we give feedback to the creator of these assets. For the final video we had to use the Noroff logo in the intro and for the outro we had to include our name and the name of the course. At last we should make a simple lighthing setup for our animation. The assignment also states that it is also important to show reference and thumbnails (also maybe inspiration) of the performance, it could be a good idea to film someone else performing the brief. A woman is standing by a table and has gotten a christmas present early, she has been told that she is not allowed to open the present before christmas. She is having a hard time choosing if she should open it early or not. She ends up opening the present and gets disappointed by the content and closes the present again in anger. in order to reach shelf but falls down and gets angry. She can also try multiple times to reach her goal. Character: A short grown up woman. Enviornment: Kitchen with table, chairs, windows and a jar of candy. Story: Character sits waiting by kitchen table looking at the mobile phone waiting for an important call. She suddenly notices a large jar of candy that she really wants, she reaches for the jar but has difficult deciding if she want’s the candy or not. She finally decides to open the jar but it’s too shut tight. 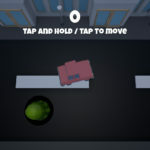 While trying to open the bowl she falls to the ground and the phone rigs. She reaches with her hand (behind the table so only the hand is shown) to answer the phone. Maybe the phone falls down a crevice or she misses the call. 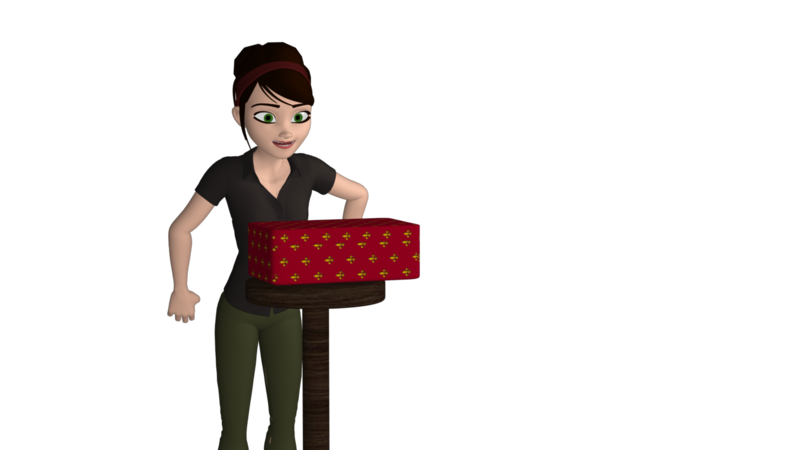 Character is having a trouble deciding if she wants to open a box that is on a table in front of her or not. She is thinking hard and looking around her so noone can see that she wants to open the box. She then finally ends up opening the box but gets surprised in a bad way and falls to the ground. I started this project by reading the assignment very thoroughly, then I made a time schedule for all the 3 weeks. In the start of the research an planning process I started by making up some stories and ended up choosing the second brief from the assignment text. Brief 2: The character really wants to do something, but knows that he/she should probably not do it. Show the internal conflict of the character. I also made some optional stories based on the briefs in this assignment but I scrapped them. They can be found under the research and planning part of this report. After the story was all set in stone I filmed my mother performing the story I’ve created. Then I draw a thumbnail/storyboard that also included some facial expressions and the timing of every frame. I also did some research on YouTube, looking at animation work by both professionals, amateurs, tutors and students for inspiration. 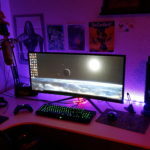 When I was done with all the planning and research I found my rig called Mery on www.meryproject.com I used this rig since I had used it before in earlier assignments and therefore it was familiar for me. 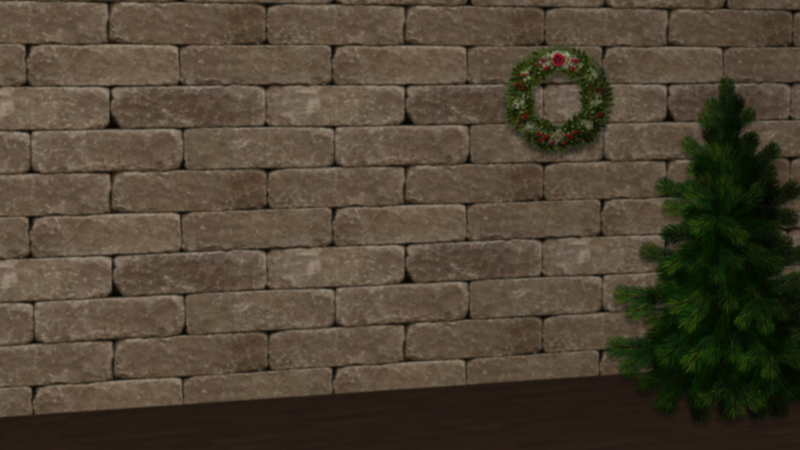 Then I set up my scene where I had a round table, the character a bit to the left in the frame, a brick wall background and a present on the table. I started early on by finding textures on google images that I applied to my table, background and the present. I did not place in the christmas tree and wreath that can be seen before later on druing this assignment. I started my animation process by blocking out the main poses before I went in and fine tuned ever part. In the start of this project my animation was a bit to floaty, I handeled this by making the character stop a bit when making an important pose. 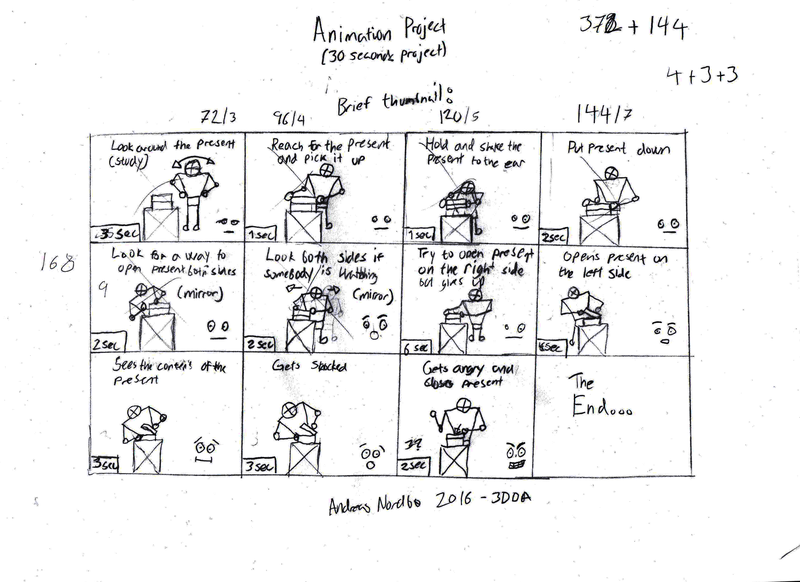 I got feedback every week from my classroom teacher that I worked on to greatly improve my animation. A very handy tool for me when animating was the 12 principles of animation series found on YouTube. 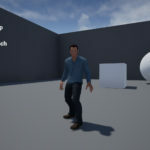 I only started to add facial animation after I was well under way with my body animation. I wanted to make sure the body show the characters inner conflict on it’s own and make the facial animation build upon the body. During the animation process I kept using the Playblast feature of Autodesk Maya in order to see the final result a bit clearer. 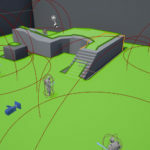 You can find some of the earlier playblast on my blog (linked at the top of this report) under the last section called «Maya playblasts showing my animation progress». 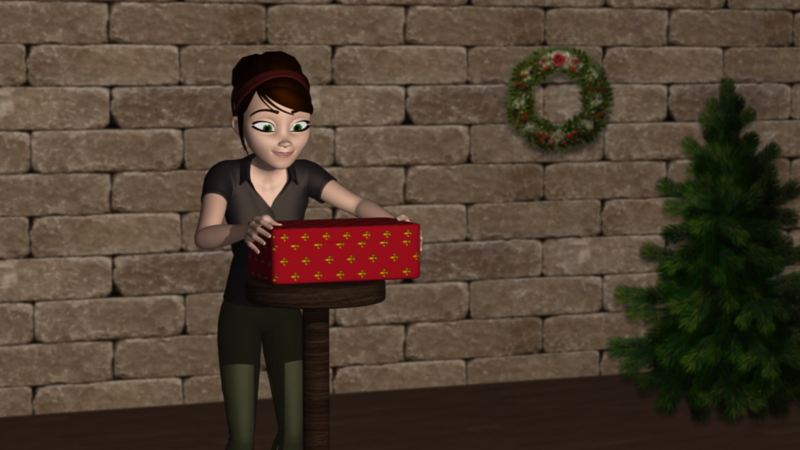 After doing the final touches to my animation I did a «test compose» where I used Photoshop to blur the background, placing in two 2D PNG images of the christmas tree and christmas wreath in the background. 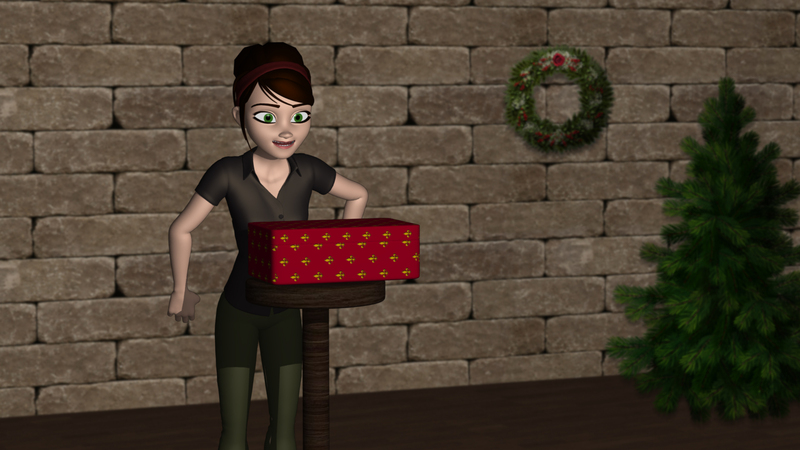 I rendered the character, table and present on it’s own with a blank background. I used the PNG format of my final rendered images so that it included an alpha channel and transparency so that I could have tha background as it’s own layer behind the character, this also greatly reduced the rendertime per image. It took about 11 seconds to render each of the single frames of the 760 total. In the end I composed my animation in Adobe After Effects, where I first put the frames together to a final video with 24 fps. Then I added the background made in Photoshop (rendered in Maya) behind the character. At last I added music and the required intro and outro. All in all, I think this project went pretty smooth, I did put a lot of time into every aspect of this project the last three weeks. Since this is an animation there is always ways to improve my final product, I could use months fine tuning this animation without it beeing perfect. The animation I ended up with were not an exact replica of the one that I filmed as a reference and drawn a thumbnail of, I had to improvise and change out some parts as I saw fit for my animation. I also made some parts like the facial expressions more excessive to make it clearer what the character is thinking and feeling at the exact momments. When looking back to the first playblast I did, I have had a huge improvement in all the parts of my animation, the scene setup and textures used, lighting, render quality and render time. Some things that I could’ve improved was to get rid of the minor arm pops and working on the anticipation in the start of my animation. I do NOT take credit for any of the textures, rig and music used in this animation.